Problems with leaking water heaters is one of the most common calls we get here at Atlantis Plumbing. Our plumbers are VERY experienced when it comes to diagnosing where the leak is coming from and fixing the problem. So, what can you do when your water heater leaks? The answer depends on where the leak is coming from. 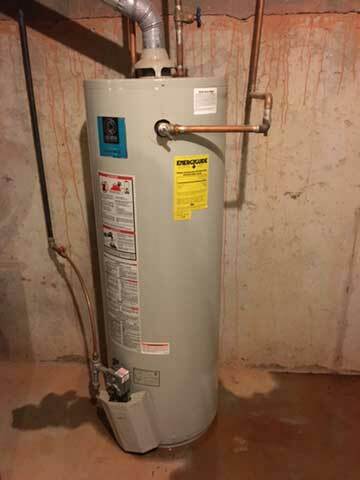 A leaking water heater may not seem like too much of an emergency but as a plumber and owner of Atlantis Plumbing I am here to tell you that that "small problem" can quickly turn into a very big one. After all, even a small amount of water can cause serious damage to floors, subfloors, walls and anything else that it comes in contact with. And, if left alone long enough, the mold and mildew that can result because of all this water can be damaging to your health. Also, a leak, especially a small one, is just a warning sign that something is wrong and the problem is just going to get bigger. Bottom line is that it's simply not worth it to ignore a leaking water heater. How Do You Stop A Water Heater From Leaking? There are things that you can do to stop your water heater from leaking out anymore water. Make sure it's a leak - just because you see some water on the floor near the water heater does not mean it's leaking. It could be condensation from a nearby appliance or pipe. So, dry the area and run your hands on the water heater and the plumbing fittings to see if you feel water anywhere. If you do not feel any water, wait an hour or two and then come back and inspect the "spot" to see if water has begun to accumulate again. Turn off the power supply to the water heater. For electric heaters - switch off the breaker for the water heater in your circuit box. For gas heaters - there should be an on/off switch or dial to turn it off. If the leak is significant you will want to turn off your water supply as well. There should be a shutoff valve on the pipes to the water heater. It could be a wheel that turns or a ball-style valve. You can check out our article on How To Turn Off Water To Hot Water Heater. If you need help, call us at Atlantis Plumbing at 770-505-8570and we will help you through this step. Check where the pipes connect to your water heater. Perhaps there's just a loose fitting that can be tightened with a wrench. Check the pressure relief valve. Leaks can occur here if your hot water heater's temperature is set too high or the water pressure in your home is too high. The temperature should be no higher than 140 degrees Fahrenheit and the water pressure should be between 45 psi and 75 psi. Check the bottom of the water heater. As much as you can, check the bottom of the tank because it could be that the tank has developed a crack. Check the drain valve of the tank. The drain valve is located near the bottom of the tank and it should always be completely closed. If it's leaking the solution could be as easy as replacing a worn out washer. If these steps do not stop the leakage call your plumber to come in and fix the problem as soon as possible. What's Causing Water Heater To Leak From The Top? If you see that your water heater is leaking from the top, here are 6 of the most common issues that could be causing that. What's Causing Water Heater To Leak From The Bottom? A leak at the bottom of a water heater could be due to one of two reasons. Now, if the leak is from the drain valve that may be an easy fix. Tightening it or replacing the washer may fix the issue. But, if the unit has a crack or has rusted out - the only solution then is to replace the water heater itself. What Causes The Relief Valve On The Water Heater To Leak? As we stated earlier in the article - the two main factors that could cause your relief valve to leak are...if your hot water temperature is set too high or if the water pressure in your home is too high. Although most relief valves are defaulted at 140 degree Fahrenheit it's recommended to keep the temperature at 120 degrees. The water pressure in your home should be between 45 psi and 75 psi. If you notice that it's 80 psi or more, then you have a high water pressure problem. The solution to a relief valve problem is simply to have it replaced. If you are a DIY type of person you can replace it yourself. But of course, a professional plumber can do the job for you. Depending on the cause and the solution to your water leak problem - you may have to decide if you should fix or repair your water heater. According to InterNACHI (International Association of Certified Home Inspectors) - gas water heaters have a lifespan of 6 - 12 years. So, if your water heater has approached this time span - it may not be worth it, monetarily, to repair it. Here's more information to help you make the decision of whether you should repair or replace your hot water heater. Should the water heater be making noise?Generally no. Water heaters can make popping noises or hissing noises and the causes could be a variety of things. We do recommend that you call in a plumber if your water heater does begin to make noises. We can assure you that it most likely will just get worse. Is a leaking water heater dangerous? Yes, absolutely. The unit could explode, the leaks could be due to rusty pipes which could pose a danger to your water supply. Of course property damage due to a leak is highly likely. Can a hot water heater leak gas? Yes, a gas water heater can leak gas. This is highly dangers because the small ignition flame on the heater could ignite and cause an explosion. If you are considering replacing your Polybutylene pipes in your residential or commerical property, call the Atlanta plumbers - Atlantis Plumbing today at 770-505-8570. We are available 24 hours a day, 7 days a week.